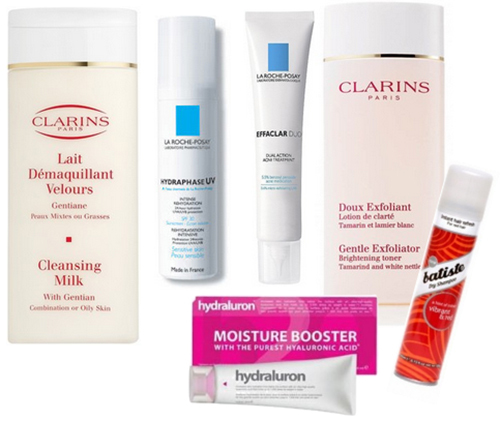 Clarins Cleansing Milk For Oil Skin - I've been looking to overhaul my skin care routine. I need to start again from scratch and go for something more gentle. This seems like the ideal way to cleanse my skin of a morning and remove my makeup at night. La Roche-Posay Hydraphase UV - I've slipped a little with wearing UV protection during the day except in makeup products. Some moisturiser I've tried in the past with SPF can be quite oily. This is for sensitive skin so I should imagine it's quite light. Perfect for daytime hydration. La Roche-Posay Effaclar Duo - Another favourite amongst bloggers. Especially for those prone to breakouts. My skin has been a lot better of late, which I think is down to the amount of water I'm drinking lately. But it's still not perfectly and this helps with the general surface of the skin. Clarins Exfoliator Brightening Toner - An exfoliator and a toner? All in one? Yep! The skin God that is Mrs Caroline Hirons suggested this to me after telling her all about my skin care problems. It's said this should be used once or twice a week but Caroline says it can be used twice daily. Hydraluron Moisture Booster - This seems to be a massive hit amongst bloggers. I will admit the fact it's made with acid put me off but after reading up on it, it's of the good kind. This helps improves your skin hydration. I've been looking for a serum to use but they always baffled me. So many people swear by this as it's for all ages and skin types. Batiste Vibrant & Red - I love love love Batiste. It is an essential for anyone with unnatural coloured hair as every time you wash it, you wash the colour out. So I tend to wash it twice a week and that's it. Batiste is fab but when it applied it leaves your hair with a white/grey tinge. With my hair being so bright red it doesn't always brush out and I end up having a faded looking tinge to it. This is a new addition to the lineup and looks just perfect for my needs! 54-58/365 - If You Dare Come A Little Closer. Everyone Has A Deep Secret. 49-53/365 - I Knew You Were Trouble. Philosophy Raspberry Sorbet Shower Gel. 45 - 48/365 - She Bought A Gun With Her. Models Own Ice Neon Collection. M.A.C Mineralize Skin Finish Natural - Light. M.A.C Up The Amp Lipstick. 40/365 - Chinese Chow Mein. 39/365 - Let's Make This Last Forever. 38/365 - These Are The Best Days Of Our Lives. 33/365 - My Hair Can Get A Lil' Cray. 32/365 - You Better Werq.